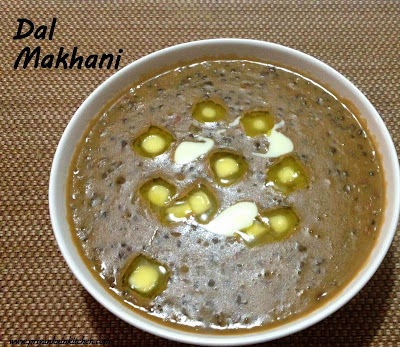 Daal Makhani is a mild curry made with black whole gram as its main ingredient. Originating from the state of Punjab, in North India, it is one of the most preferred choice of every North Indian. Though traditionally, it involves adding butter and cream to make it rich, I prefer to make it with no butter and no cream. In a pressure cooker add Black gram, kidney beans, salt and enough water. Cover and cook on high until first whistle and then on low for 10 more minutes or until soft. Cooking times vary due to many reasons. In a pan add oil and heat. Add cardamom and onion. Fry until onion become translucent. Add garlic, tomato, cumin, chili and garam masala. Fry until it starts to leave the edges of the pan. Add this to pressure cooker, mix well and turn on its heat. Cook on high until it comes to boil. Slowly add milk to it. Reduce the heat when everything comes to boil. let it cook on low flame for 15-20 mins. Add more water of milk as required to adjust the consistency.